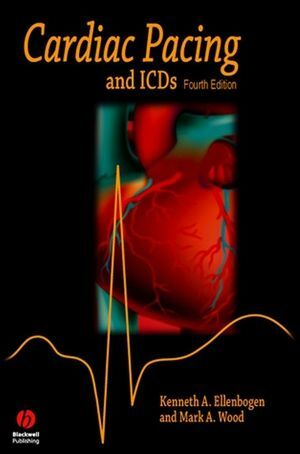 Fully revised and updated, the fourth edition of Cardiac Pacing and ICDs continues to be an accessible and practical clinical reference for residents, fellows, surgeons, nurses, PAs, and technicians. The chapters are organized in the sequence of the evaluation of an actual patient, making it an effective practical guide. Revised chapters and updated artwork and tables plus a new chapter on cardiac resynchronization make the new edition an invaluable clinical resource. Ken Ellenbogen, MD, is a professor of medicine and director of the Electrophysiology Laboratory at the Medical College of Virginia. Mark Wood, MD, is associate professor and assistant director of the Electrophysiology Laboratory at the Medical College of Virginia. Chapter 1: Indications for Permanent and Temporary Cardiac Pacing. Pugazhendhi Vijayaraman, Robert W. Peters, and Kenneth A. Ellenbogen. Chapter 2: Basic Concepts of Pacing. Chapter 3: Hemodynamics of Cardiac Pacing. Richard C. Wu and Dwight W. Reynolds. Chapter 4: Temporary Cardiac Pacing. Mark A. Wood and Kenneth A. Ellenbogen. Chapter 5: Techniques of Pacemaker Implantation and Removal. Jeffrey Brinker and Mark Midei. Chapter 6: Pacemaker Timing Cycles. David L. Hayes and Paul A. Levine. Chapter 7: Evaluation and Management of Pacing System Malfunctions. Chapter 8: The Implantable Cardioverter Defibrillator. Chapter 9: Cardiac Resynchronization Therapy. Chapter 10: ICD Follow-up and Troubleshooting. Henry F. Clemo and Mark A. Wood. Chapter 11: Follow-up Assessments of the Pacemaker Patient. Mark H. Schoenfeld and Mark L. Blitzer. An accessible and practical clinical reference for residents, fellows, surgeons, nurses, PAs, and technicians.